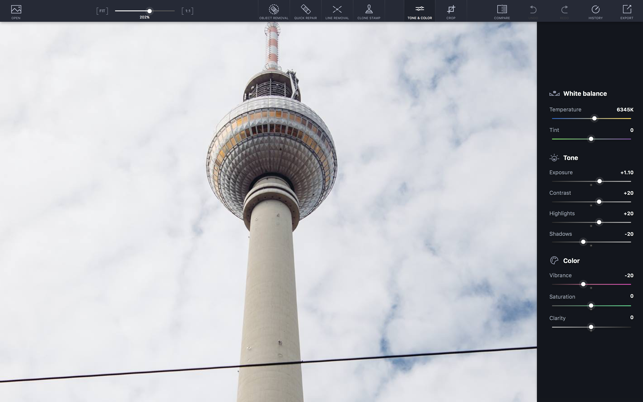 TouchRetouch allows clearing your photos from undesired objects in an instant. It also comes in handy when dealing with color correction and composition problems. • Unwanted objects like debris, garbage cans, street signs, shadows, etc. Get rid of unwanted elements from photos quickly and easily by using the advanced content removal tools the app offers. 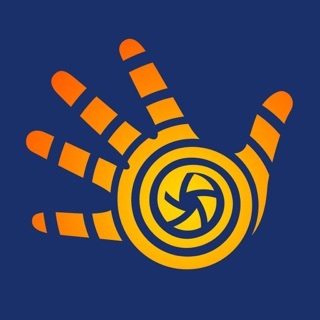 The highly intellectual algorithm implemented in the app works well for both plain and more complex backgrounds (bokeh, gradient, patterned, etc.). 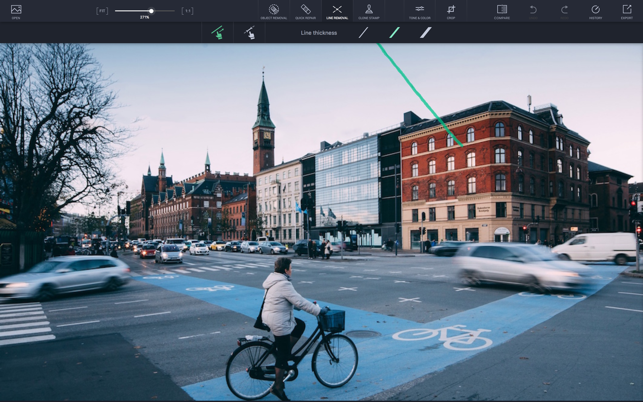 Mark a line by tracing along a section of it — the smart line removal technology that lies in the app will automatically select and remove the whole line. Clear photos are only a click away. Single-click a blemish that you feel is spoiling your composition and sigh with relief — the flaw is immediately gone. Use Clone Stamp to remove objects that are in a complex background or close to the edge of other objects. Just copy pixels from one area within your photo and paint with them over another area. In case there is a distracting element in the background of a picture, you can easily cut off the spoiled part of the photo with the Crop tool. Make color adjustments to your photo to ensure that your final edited piece looks the way it should. 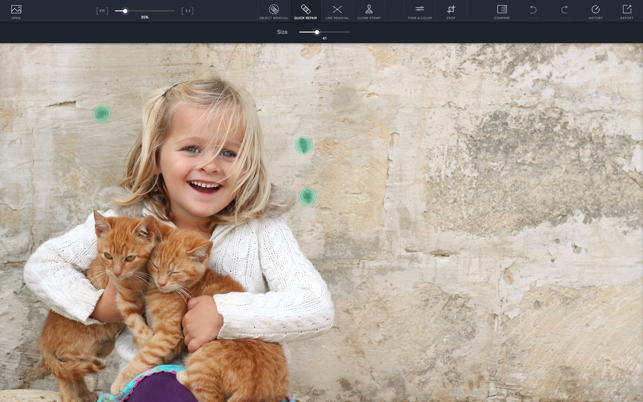 Turn your Mac into an “unwanted content removal” studio by downloading TouchRetouch now. • Support for JPEG, TIFF, PNG, etc. If you want to remove unwanted objects, this IS the app! Wow! I have been looking for a photo editing program that would allow me to EASILY remove unwanted background objects and touch up the background of the removed object so that it appeared photo-realistic. I looked at multiple apps claiming to do that but, thankfully, their free trials proved otherwise. I came across TouchRetouch while looking at possible apps on my iPad, went to the developer’s web site, and found there was a Mac version (my preferred platform for photo editing). I spent about 10 minutes familiarizing myself with the app’s tools and functions. Then, in less than 20 minutes I removed six people in the background of a photo of my wife and I at Stonehenge. I showed the before and after photos to my wife, who was astonished. I wish I could upload the before and after photos so you could see for yourself what a novice easily accomplished. 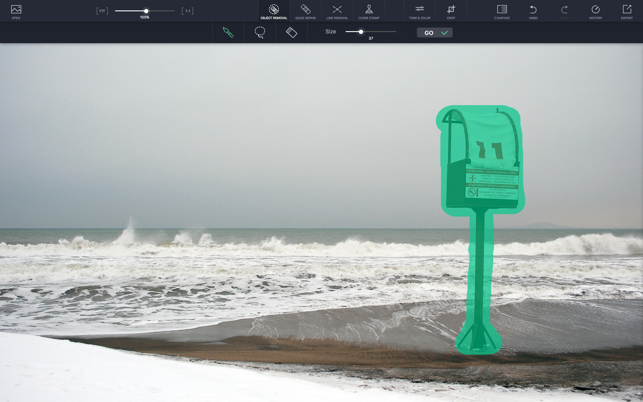 One hint from a reviewer of the iPad version: use the zoom feature to enlarge the photo details so you can accurately use the brush or lasso to highlight details to remove. If you overshoot an edge, use the eraser to remove as needed. The clone tool is also a very, very clever feature. If have been looking for a photo editing program to easily remove unwanted objects, look no further. This program is amazing and easy to use. It is more than deserving of my 5-star review and I encourage you to consider it for your photo editing needs. This is what I have been looking for! Wow! I came across TouchRetouch while looking at possible object removal photo editing apps on my iPad, went to the developer’s web site, and found there was a Mac desktop version (my preferred platform for photo editing). 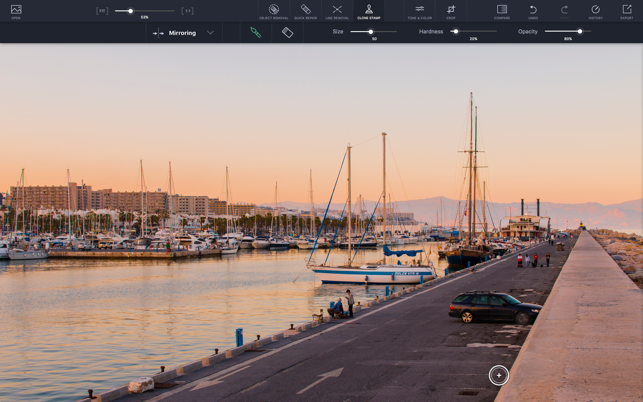 After purchasing it on the Mac App Store, I spent about 10 minutes familiarizing myself with TouchRetouch’s tools and functions. Then, in less than 20 minutes I removed six people in the background of a photo of my wife and I at Stonehenge. I showed the before and after photos to my wife, who was astonished. I wish I could upload the before and after photos so you could see for yourself what a novice easily accomplished. One hint from a reviewer of the iPad version was particularly helpful: use the zoom feature to enlarge the photo details so you can accurately use the brush or lasso to highlight details to remove. If you overshoot an edge, use the eraser to remove as needed. The clone tool is also a very, very clever feature. If have been looking for a photo editing program to EASILY remove unwanted photo objects, look no further. TouchRetouch is easy to use and produces amazing results. It is more than deserving of my 5-star review and I encourage you to consider it for your photo editing needs. I have the iOS products and love them and have used them extensively for the past few years. When I saw the Mac version I purchased it just to help the support the Developer. I have used the app and it is stable and works very well on iOS 11.4 and Mac OS X (High Sierra).